Sometimes when I finish a really good book I just can’t wait to dash off to the computer and write my review – I want to tell everyone about it. 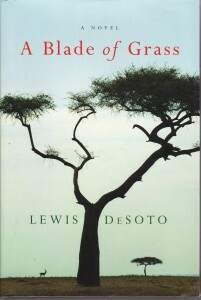 That’s the way I feel about A Blade of Grass by South African/Canadian author Lewis Desoto, which was longlisted for the Booker in 2004. It’s a story of an inter-racial friendship set on the contested South African frontier in the 1970s during the apartheid era. I found it to be a remarkable debut novel that was engaging from the very beginning yet managed to raise complex issues about entitlement to land; about power and gender; and about the destructive effects of fear of The Other. So you can imagine my surprise when I discovered from some outraged comments at GoodReads that some readers are very cross about this book. For some, there is too much lyrical description, for others too much symbolism. One who thought that DeSoto also has absolutely no place in writing from a female perspective took issue with the way that the peace and harmony of the relationship between two female protagonists, one Black, one White, is disrupted by jealousy over a man. Someone else is peeved about the stereotyping of entrenched racist Afrikaaners; ambivalent, hopeful Britishers; and resentful, disenfranchised Africans. (There was also a reader who thought it was set during the Boer War. The less said about that the better, eh?) The novel copped a very negative review at Culture Wars too. I don’t think that I read this novel uncritically, so I was relieved to see not only some positive views amongst the others at GR, but also this one from Quill and Quire. I felt that this novel rendered the complexities of living in a racist society with the respect it deserves. The two central characters, Marït and Tembi, are creatures of the society in which they grew up and their identities are forged by the black/white divide. Even when they transcend this divide, as Desoto renders it, they inevitably retain some habits of thought and behaviour, and in moments of crisis they revert to old habits even if intellectually and emotionally they reject them. This seems entirely realistic to me. Marït is a recently orphaned Afrikaaner married to an Englishman who is farming in an area subject to attacks coming from over the unnamed border. Her husband Ben is able to fulfil his dream and buy a farm there because it’s cheap, but he’s killed in what is labelled a terrorist attack by the white community. (Even the labels that are used are pregnant with meaning. Which one to use? Freedom fighter when we approve, and terrorist when we do not? But the victims suffer just the same, whichever). Marït, who has always doubted her hasty choice to marry and become a farmer’s wife, has never taken any notice of the anonymous Black workers on whom she must now depend. Alienated from the well-meaning but officiously racist local women with whom she has nothing in common, she finds herself drawn to Tembi, an outsider within the Black community, who took over the role of meid when her own mother died in a roadside accident. The colour bar all but collapses as these two young women comfort one another and take on the management of the farm because neither has anywhere else to go. DoSoto is particularly good at rendering their shifts in identity using the clothes that identify their fluid allegiances. But as the border conflict intensifies, the survival of two women alone on a farm becomes an impossible dream. The rivalry between the women when Khoza arrives is only superficially sexual: their conflict symbolises the moral issues underlying land ownership in a post-colonial society: both women love the farm and believe they have a moral right to it but only one can have it. (Khoza speaks Shona, a Bantu language, and he has walked from over the border at Zwartloof. He is, however, completely out of his depth when it comes to the complexities of a civil war. He represents only a longing for justice and equality, a hunger for land, and a sense of resentment). Tembi watches a blade of grass arrow into the current. She imagines herself tiny, small enough to sit on it, as if it were a boat. She imagines the boat travelling down canyons, through villages and towns, even through the cities, coming at last into a lagoon that spills out to the ocean. She imagines a yellow beach and crashing waves and ships offshore. ‘I wonder where this river goes, ‘ Tembi says. This single blade of grass, a strand plucked idly in passing, will float down this single river, and join a larger river where other streams flow into it. There, Tembi imagines, they will become one river, and plunge into the sea, all becoming one. But the farm at Kudufontein is no Eden, and the ending is quite harrowing as the reader knows it must be. Nevertheless there is hope, not because of the scenes that bookend the story with Tembi planting seeds, but because the fragile friendship across the colour bar foreshadows the end of apartheid. With an addiction to South African novels and embarrassment that I don’t read enough Canadian lit, this will have to go on to my list. Thanks so much! There is some very interesting literature coming out of the ‘new’ South Africa, new voices, black, white & expat, reflecting on a society in tumultuous transition. I wish I knew of a South African blogger to follow! https://roughghosts.wordpress.com/2015/01/21/home-is-wherever-you-find-yourself-the-alphabet-of-birds-by-s-j-naude/ and have a collection of SA books on my endless TBR list. I noticed on one of your posts that you admire Galgut, he is one of my favourite authors. The conflicts and tensions in the new South Africa provide a great backdrop for literature in a way similar to central/eastern Europe. Do you have a South African shelf at GoodReads for reference? No, I am a very random GoodReads user. I can tell you that this year I hope to explore some of the work of Ivan Vladislavic (Double Negative and the Restless Supermarket), The Book of Happenstance by Ingrid Winterbach and Agaat by Marlene Van Niekerk. I have Sleeper’s Wake by Alistair Morgan and a book by K Sello Duiker. I am also interested in Zakes Mda and Zoe Wicomb. http://bookslive.co.za is good resource too. I’m a bit surprised you came up with this book to read since it is ten years old, but it sounds like it was a good experience. Maybe I’ll read DeSoto’s next novel. Oh, Tony, I’ve got so many books that I bought ten years ago and more! I am having a bit of a blitz on the shelves that are overflowing, that is, there is literally nowhere to squeeze the book into. C-D & E-F-G are in crisis, and so is K-L, but the Ms have been tamed a bit though everything from N onwards is encroaching on the shelves reserved for what I’ve already read. (This is a good time to do it because over the summer break publishers stop sending me tempting new books). BTW I haven’t got it myself, but Desoto is a painter, and his latest book is about an artist in Paris, it’s called The Restoration Artist. Since I love books about art, it’s on my wishlist, but I’m not going to buy it just yet, not so soon after I’ve made a bit of space on the shelf!